We believe that women’s businesses play a major role in building a more inclusive world. However, female entrepreneurs face many obstacles in their business development including: lack of visibility, access to support networks and cultural acceptance. Enthusiastic and dynamic women who have built a business with a social impact and widespread potential. An 8-month program designed to assist selected women entrepreneurs with visibility and business mentoring, while also raising global awareness on female entrepreneurial potential. SPOT – Call for projects, from October 5th to November 25th 2017. Brazil, Egypt, France, Hong-Kong, India, Indonesia, Japan, Mexico, Nigeria, Philippines, Singapore, Thailand, Turkey, UK and USA. The call for projects will last from October 5th to November 25th. Agriculture, Connectivity and Mobile Services, Education, Financial inclusion, Healthcare, Insurance and Safety & Security. Projects must meet certain criteria to be considered for this program. *Please see details of the application in the “Call for projects” section. On March 8th 2018, an alliance of 20 international newspapers will publish stories on 20 Women Entrepreneurs for Good. This communication operation will offer great opportunities for the professional development of the women concerned. In addition, by highlighting female role models and inspiring stories, this operation will also act as a mass awareness campaign on women entrepreneurship. You can also be part of the story by supporting these tremendous women and making their achievements heard as widely as possible. Get ready to share these inspiring stories on March 8th! This media operation is led by Sparknews, an organization specialized in the creation of collaborative Solutions Journalism programs. 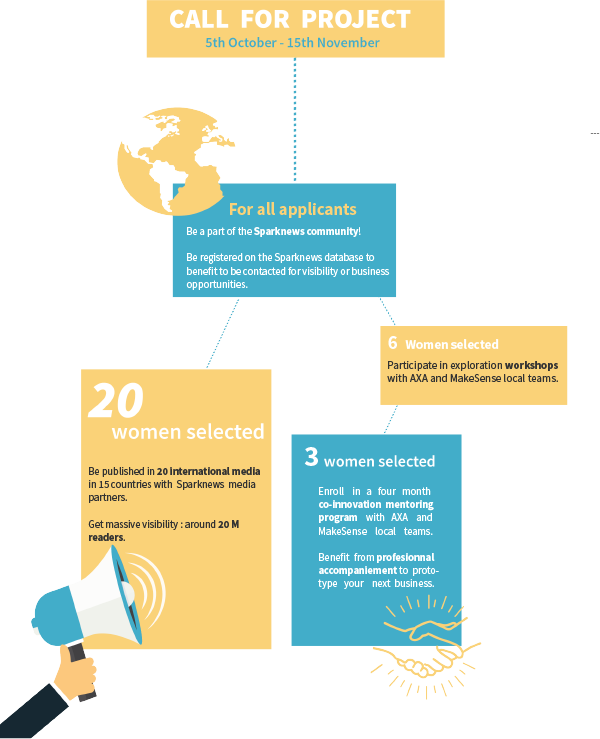 After this date, AXA (global leader in insurance and asset management) and MakeSense (an organization specialized on supporting social entrepreneurs) will offer 3 women entrepreneurs the opportunity to accelerate their business development and scale their impact with AXA. What to expect if you are selected ? The programs are composed of coaching and mentoring sessions, collaborative workshops with your team and AXA, operational and strategic support.